Alright! as promised… this is the short (hopefully) post on priming and bottling. I have to say, this has got to be the most annoying part about brewing, and as far as I’ve read, I’m not the only one that thinks so. Fortunately I think this is mostly due to our equipment and not so much to the actual act of priming and bottling. So!, first things first, check out the following pic. In the photo above you can see our equipment prior to bottling. On the left you can see some bottles, some are clean, some are not. then to the right of that you can see the caps, the siphon and the cap placer. All the way to the right you can see the fermenter with the pre-carbonised beer. On the bottom you can see our brewing pot. Since we don’t have a bottling bucket at the moment, we used the pot to both disinfect and prime. The pot filled with disinfectant was used to fill the bottles and then rinse them. Since it’s StarSan, we didn’t really need to wait for it to dry and we just bottled that way. Once we had everything ready and all the bottles lined up in the disinfectant pot we started preparing the primer. Priming as many of you probably already know, is the act of adding some more fermentable materials to the pre-bottled beer to enable a bit of extra fermentation. 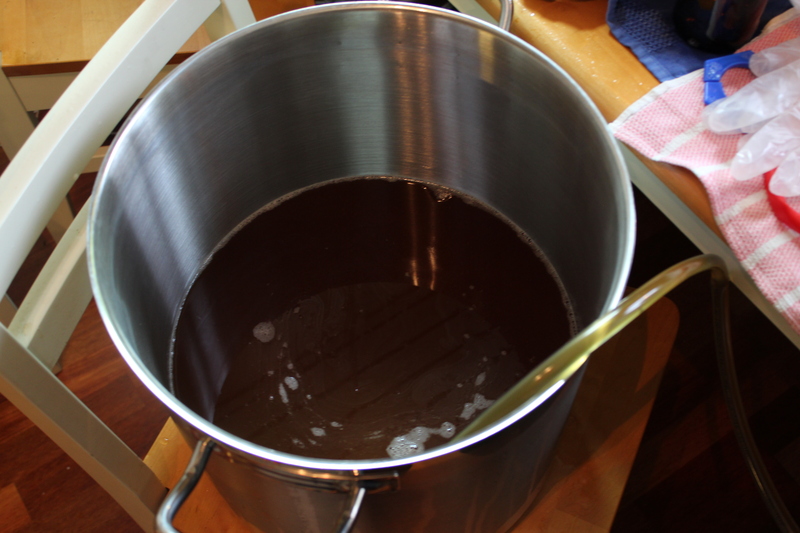 This extra fermentation is not so much to create more alcohol as it is to carbonate the beer. That is generate a bit more CO2 in the bottle and create the bubbles, the head (Proteins and lipids also affect this though) of the beer and its general fizziness. There are two ways to do this: the old way, and the better way. The old way.- basically add a teaspoon of sugar to each bottle. The advantage of this is the capability to bottle directly from the fermenter, the disadvantage is that your pouring solids into a bottle, possible inequality in the distribution, and its generally annoying. The better way.- Having a bottling bucket (or similar) use a liquid solution with fermentables and mix it equally with all the beer. The amount of fermentables depends on the type of fermentable used. In our case, since we used table sugar we used around 90 grams boiled in 2 cups of water, then cooled it a bit. The normal amount for a 19L batch is around 114 grams, but we had a 17L batch, so we made some “on the fly” estimation and put 90. This mixture was put at the bottom of the pot we were using as a bottling bucket. After this was done we started siphoning the beer from the fermenter to the bottling pot. We avoided any stirring and rough transfer to avoid oxidation. You can see part of the transfer in the following pic. Once the pot was full we used a large spoon (disinfected of course) to mix in the mixture, carefully avoiding oxidation. As I recall, it is suggested to leave this sitting for around 30 minutes before bottling, but since we were in a hurry we decided to go ahead and do it. Unfortunately, we didn’t manage to get any good pictures of the actual bottling as this required both of us to be helping in handing the bottles over. The basic process is quite straight forward though. 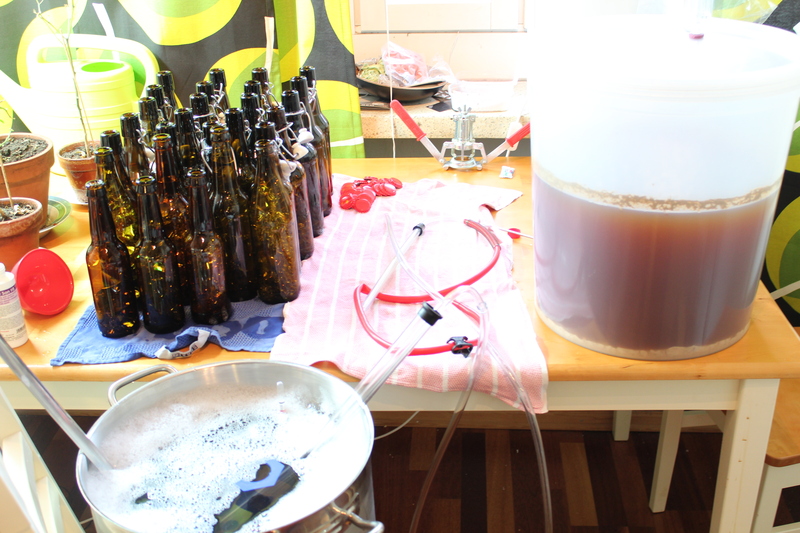 It is only required to put the siphon in the bottling bucket(pot) and start siphoning into bottles. Since we didn’t have a filling tube we had to pinch between bottles… it was very messy. In the end though we managed relatively fine. We filled 20 swing top bottles which saved a lot of caps and helped my patience. The other 20+ bottles were capped with a very old, very annoying tool. We broke one bottle and had some troubles, but in general we managed to bottle ok. We now have a bottling tube so hopefully next try will be better. The bottles have been stored now for 1 1/2 weeks in a dark place. This Sunday will be the official trial and we’ll see how bad or good it came out. Expect the first evaluation post at some point next week. Final Gravity! we took a measurement before bottling and we got the FG around 1.010. This means we got an ABV of around 5.2%. I got this calculation with an online calculator, I didn’t feel like doing numbers at that point. Next post will be about our second beer recipe. Anni will post that at some point this week or next. See you then!